Revenge ! This is what France had envisaged in its war plans from the onset of hostilities when Germany declared war against France and her allies. For a little over forty years the French had a burning desire to reclaim her lost provinces of Alsace-Lorraine and finally the wait was over ? The region had been a part of France since the 17th century, gained through treaty and later annexation under Louis XIV. However, the Franco-Prussian war of 1870-71 saw a coalition of German states take the provinces away from France in the spoils of war. Strategically, apart from its beautiful towns, picturesque landscape and vineyards, the German’s had robbed the French of Lorraine’s vast iron ore deposits. This was something the French would rue in the decades that followed as Germany armed itself in a race for supremacy. Though, as hard as the new German state tried to accommodate the French-speaking people of Alsace–Lorraine, a strain in relationships would always exist between them right up to the eve of the First World War. 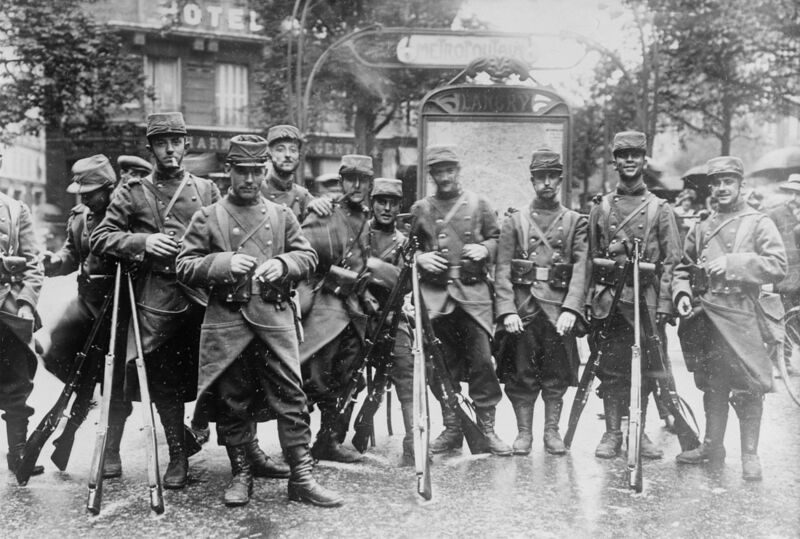 August 1914, presented the French with its best yet chance to reclaim its long-lost provinces. Therefore, as soon as Germany had invaded Belgium, the French had no other choice but to go on the counter-offensive. There would be no mistakes this time of a defensive war as it did in 1870. Well, so they thought. 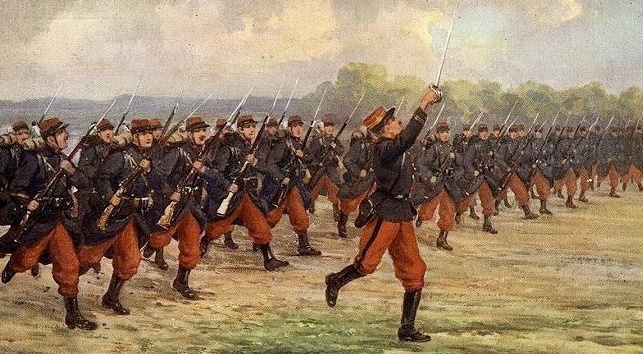 In a scene similar to this postcard illustration, French troops took the town of Altkirsch after a brief skirmish, which ended in a traditional bayonet charge. With the French ‘allowed’ to celebrate their early victories, the Germans didn’t panic. In fact, it was their plan all along to allow the French to penetrate deep into hostile territory. The idea was to stretch the French lines to breaking point, in turn disrupting Joffre’s armies abilities to communicate and gather reliable intelligence. The German’s were also in a better state than the French had realised. They had two more corps, numbering in total eight rather than six, mobilised to reinforce the German 6th and 7th Army. Furthermore, playing into the favour of the Germans was the fact that the French failed to engage their 5th Army along the frontier. The 5th Army was instead left in a defensive position along the Belgium border, which inevitably conspired against the success of executing Plan XVII. When the time was right, the resistance of the Germans would stiffen. The French did have long to wait to feel the full force of the German counter offensive as it retook Mulhouse on the 9th August. One might have sensed that Joffre was embarrassed by the reversal in fortune. He was, but he still chose to launch his main attack in this area, believing Germany would not commit additional troops in the area. The French persisted and the Germans as before, were willing to concede ground to the French. Though by the 20th, the Germans believed they had inflicted enough damage and doubt in the minds of the French that it mounted a massive counter-attack led by their much heavier artillery guns and greater numbers. What ensued was a complete disaster as the French over the next few days were completely humiliated and slaughtered to their deaths. The French were forced to retreat en masse along Alsace-Lorraine and the Ardennes. Joffre had to admit, if not to himself then rather to the French nation, that what had occurred was an absolute disaster. Though, at first he would blame his field commanders, and in turn sacking almost the entire group, in favour of younger, more energetic men. Then exactly three weeks since the beginning of the war on the western front, Joffre ordered a great retreat to regroup and reform a new army on the Marne River. At the beginning of the war these French soldiers are shown in their traditional blue coats and red trousers. They would be reissued with a sensible greyish-blue uniform but not before the horrible massacres on the Frontier. In the aftermath, an unprecedented number of casualties resulted never before seen. By the 29th August, a total of 260,000 were listed since the war began, of which 75,000 were deaths. Yet despite the defeat and horrible casualties, was there still a flicker of hope left for the French ? A.J.P Taylor points out that there was, in fact he states that it was “a blessing in disguise….For Joffre, thanks to the failure of his offensive plans, had forces which he could move over to his left-wing, and thus win the battle of the Marne- against all his expectation and deserts.” This is however, an easy statement to make in hindsight. Try telling that to a distraught French nation at the end of August 1914. As for the poor people of Alsace-Lorraine, its provinces would fall back into the hands of the Germans and remain there for another four long years. The French would be left yet again dreaming of Alsace and Lorraine. Photo credits: The header image is entitled “The Black Stain” 1887 by Albert Bettannier. It is a depiction of French children being taught in school to not forget the lost provinces of Alsace and Lorraine, which were colored in black on maps. All images are in the public domain. “Children of Alsace ! After forty-four years…”, Peter Hart, The Great War, Profile Books, 2013, p.38-39. “They really look like something out of a picture-book.”, Max Hastings, Catastrophe, William Collins, 2013 p. 166. “a blessing in disguise…”, A.J.P. Taylor, The First World War: An Illustrated History, Penguin, 1966, p.25-26. One of my favorite lessons in World War I! Love the post, and the series keeps getting better and better! Great post! Was a very interesting read! Greek Fire: Antiquity’s most destructive weapon.